Get free trial of all features of Bkav Mobile Security Professional in 30 days. When your trial expires, the software will automatically return to the free version. No payment is required for the free trial. – Locates your lost or stolen phone. With smartphones running Android 4.0 onwards, you need to turn GPS on to use this feature. – Performs remote phone locks and data wipe in emergency locks (users of smartphones with an arrow in the middle of the System Bar please contact Bkav Contact Center to get timely support). – Detects change of SIM card, you will receive the new phone number if the thief insert another SIM card into your phone. – Sounds an alarm even when your phone is in silent mode. – Securely backs up contacts, messages, call logs to Bkav Cloud or SD Card. – Restores your data in a quick and simple way. – Provides online access to your data from any computers, any phones and from anywhere. 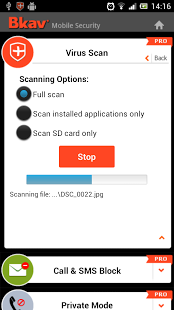 – Scans and produces warnings about the applications that might access your sensitive data like Contacts, SMS, phone location, etc… Especially, detects and removes eavesdropping apps on your mobile. – The installation and use of more than one security software on a single SmartPhone may result in software conflicts. 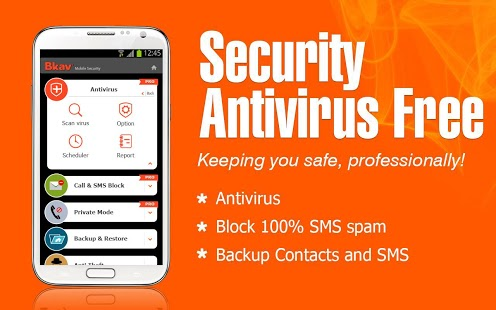 Thus, to ensure the effectiveness, you should not install Bkav Mobile Security with any other security software such as: Avast Mobile Security, Lookout Security & Antivirus, Antivirus Security, Dr.Web Anti-virus, Antivirus Free, Kapersky Mobile Security, Avira Free Android Security, Mobile Security & Antivirus, Eset Mobile Security, mSecure – Password Manager, Norton Security Antivirus, McAfee Antivirus & Security, QR Droid, BitDefende, Antivirus for Android, Zoner, Antivirus & Mobile Security, NQ Security, NetQin, Webroot Security & Antivirus, ES Security Manager, Mobile Security & Antivirus, CMC, Sophos Security & Antivirus, Android Antivirus etc. – Recently, there have been many malicious apps counterfeiting many popular software or apps such as: Facebook, YouTube, Chrome, Skype, Gmail, Yahoo, Fruit Ninja, Angry Bird, Viber, Google maps, Instagram, Twitter, Google+, Titanium Backup, Line, Talking Tom, Kakao Talk, Zalo, NhacCuaTui, Zing MP3, VTV – TruyenhinhVietNam, K+, GoTiengViet, Karaoke VietNam, SwiftKey Keyboard, Root Explorer, Beautiful Widgets, WhatsApp, WeChat etc.